I started to ponder about what she said because true enough, I do enjoy food but it was only in recent years that the passion tripled – that explains this humble food blog and how I became an avid baker and cook. My ultimate dream when I was a mere child was to be a world renowned writer. Enid Blyton and Roald Dahl were my inspiration. They helped me with my imagination and it ran wild with dreams and ideas. Fast forward to today, and I am happy to say that I still love writing (it’s my one true love) and right now, I am also equally passionate about doing something with my baking to inspire others. Eden is my current project and I am determined to give my best. I believe God has blessed my ministry (Amplify) and I with a bunch of dedicated people who will go to great lengths to serve. So… some of you might be thinking, yea it’s food, so what? haha, it is a big deal to me. Food is a central part of my life. 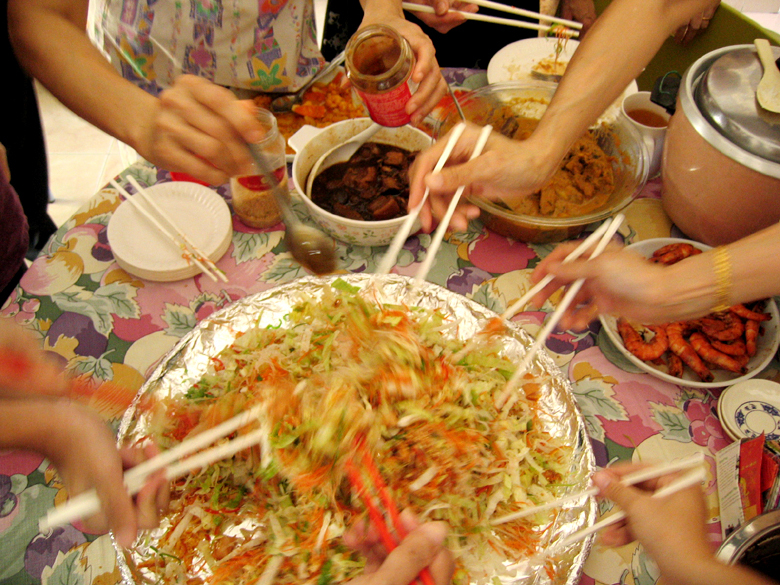 Growing up, my maternal extended family (my mum has 7 sisters, and I have 15 cousins at present) always gathered during special occasions like Chinese New Year, Christmas, birthdays and holidays. Food was always a central part of these gatherings. Every family meet was greeted with anticipation and curiousity. 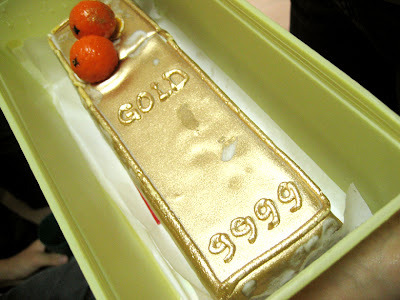 My 7 aunts can cook – and a few of them are seriously talented. You can imagine how it’s like, to be treated to a buffet of home-cooked delights all made with love! I don’t care how cliched it sounds, but hey, I can really taste the difference. Most of my memories are marked with traces of smells, tastes, lovely crispy bits of sweet and sour, spicy and bitter. Culinary memory milestones I call them. Events that bring back that whiff of freshly baked bread or doughnts, chiffon cake, etc. Each food item holds a memory and vice versa. That’s how my mind works I guess. When you’re brought up in a family that places an emphasis on good homecooked food, then you’d naturally have ‘food values’ inculcated one way or another. Food is a sign of hospitality too and I like that. I get excited when I bake for others. Today I have plenty of yu sheng photos that I took during Chinese New Year at my grannie’s place. All my relatives from my maternal side were here. There was good food and I was too busy to take shots of every dish but here’s a peek at my aunts’ yu sheng. Homemade and totally fresh! Cheaper too…. Here’s the tossing…. 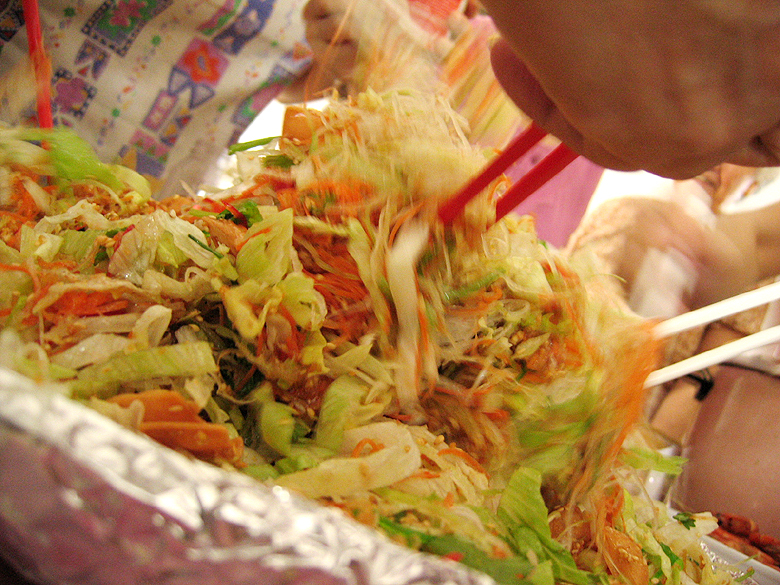 “Lo Hei” they call it in Cantonese, I think. Many hands and pairs of chopsticks make for more prosperity? Yes? Not? Whatever it is, the yu sheng tasted good… hahaha..
It’s edible! The whole bar! Someone gave it to my aunt. It’s some butter cake sprayed with edible gold paint… I think it’s cute. But I heard it doesn’t really taste good. Don’t know how much they sell it for. Anyway I think today was the 7th day of the Lunar New Year and it’s everyone’s birthday! So Happy Birthday to you, you and YOU! *P.S. For all who have been asking me about my bake sale, I will have one in the holidays, probably in April so look out for it! I’m itching to bake! I haven’t baked much since I started the semester at SMU. Busy busy busy me… ahhhh.. okay I have got deadlines to meet! yum! all that looks so yummy! Didja know the black nut contains poison! aaaaaaaaaaaaaaaaaaaahhhhhhhhhhhhhhhhhhhhhhhhhhhhhhhhh i hate you cheryl! You make all the food look so good! lol! since you’re at smu, please hold a bake sale! then i can easily collect my goodies from you pretty please? 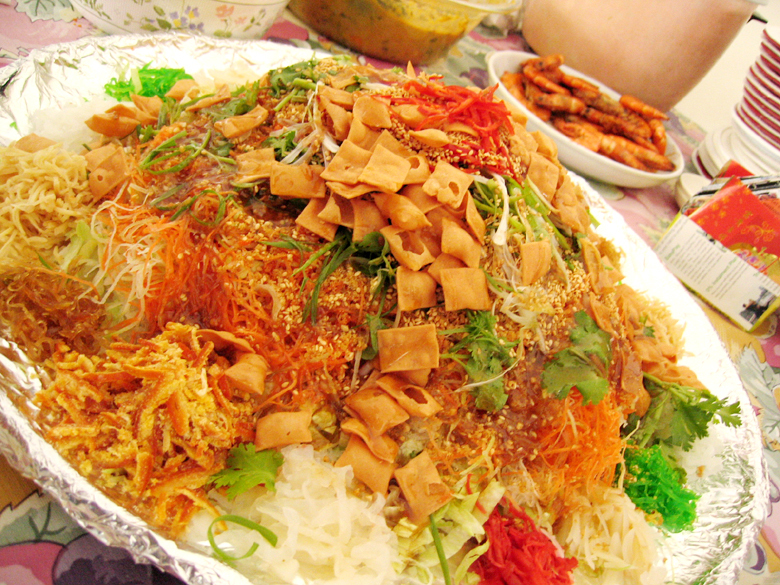 i can’t help but to drool at the sight of the large plate of yusheng though i’m not such a rawfish fan, i love the crackers!!! by the way, do you happen to know how to bake kueh bulu? Just got back from vacation so I’m back to wish you a belated Happy Chinese New Year! This plate looks very interesting! we have something called bhel which has tomatoes and onions as wet rest all dry savoury items which looks similar to this. Great post and photos! I’m Cantonese myself and I’ve never seen/heard of this delicious-looking dish in my life. 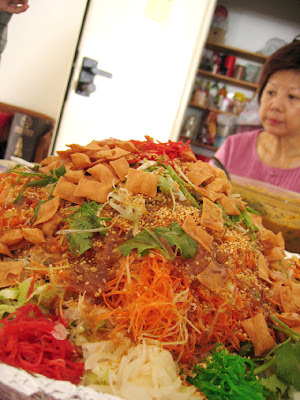 So I had to google “Yu Sheng” to learn that it’s a fish salad popular for Chinese people in Singapore and Malaysia. I love how there’s still tradition Chinese dishes out there I have to try.